Our User Activity Reports aim to deliver valuable information and analytics to understand the user activity and ad engagement. 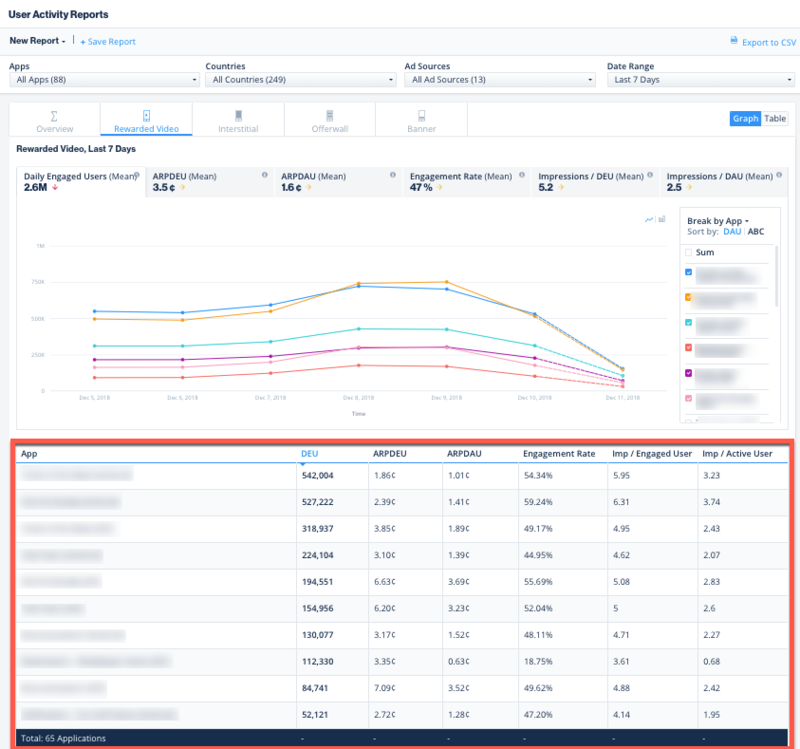 With user-level KPIs, in-depth filters and helpful breakdowns, your User Activity Reports provide the necessary granular data you need to make calculated decisions to optimize your ad revenue! User Activity insights are available for Rewarded Video, Interstitial, Banner and OfferWall ad units. If you have saved reports in the past, you can view them by clicking the arrow next to ‘New Report’. Date Range and Filters can be found at the top of the page. Use these to deep dive into your app’s performance and better understand your user activity. These filters make it easier to find specific results and separate the rest of the data to simplify the report. 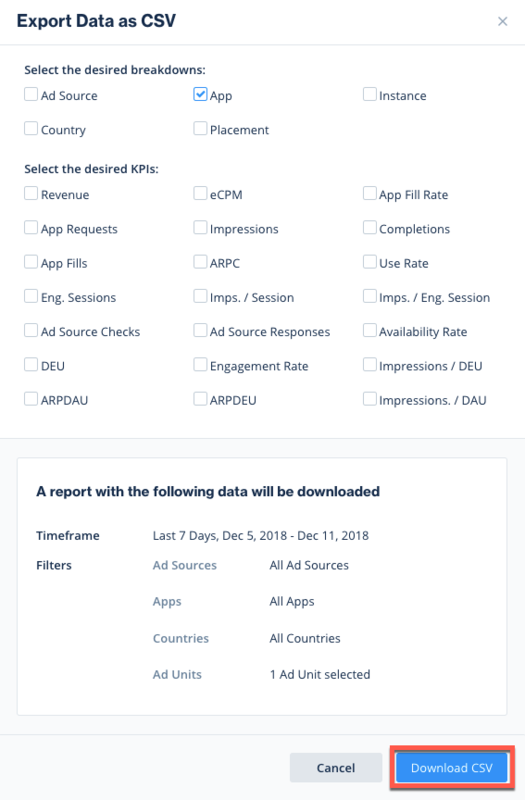 Apps: Choose to view reports only for specific apps, to isolate the data for certain apps or per app you monetize with ironSource. You can choose to simply include or exclude certain apps. Countries: Refine your reports by country to understand your apps’ performance based on the geo and demographic. Ad Sources: You can filter your reports by ad source to better understand the performance of a specific network. You can choose to simply include or exclude certain ad sources. Date Range: Choose the time frame for which you want to view your report. Select any predefined range or create a custom date range. Breakdowns can be found on the right side of the graph. Use these to create different views of your data based on the selections you’ve chosen in the filters section. Customize the view even further by selecting how the list is sorted, as well as the checkboxes which control what you see in the graph. You can examine your reports for all ad units in the Overview tab or for to view each ad unit separately simply navigate between the tabs. You can view your reports in two different formats- Graph & Table. The Graph format shows patterns of your data based on the defined breakdowns and filters. 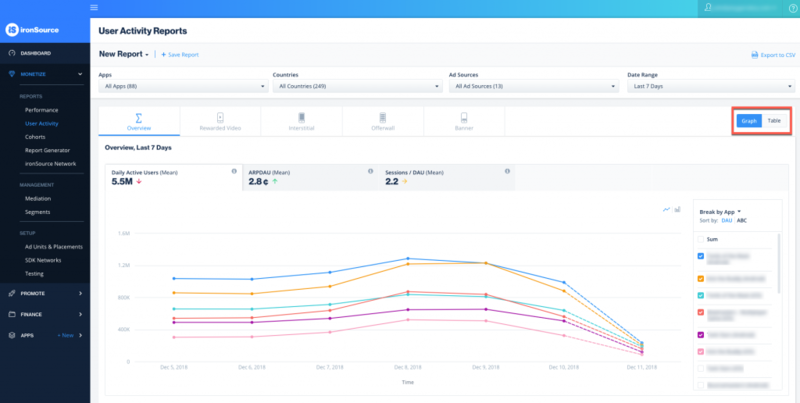 You can see the fluctuation of your performance in a visual format, which makes it easier to understand trends and provides a better view of the data over time as a whole. Metric Totals in Table You can view a summary of the metrics portrayed in your report in table format, below the graph. The numbers in the table are a total of each metric, i.e. the total DEU, ARPDEU, ARPDAU and Engagement Rate. The table reflects the identical breakdowns and filters you defined for the graph. The Table format presents your data in columns and rows based on the defined breakdowns and filters. You can see exact values alongside dates which makes it easier to compare individual numbers. This format is better to use when you’re trying to understand or compare specific parts of your performance. Click on the headers to reverse the order of the data (i.e., clicking on Date will reverse the order from chronological to reverse chronological). You can extend the number of rows at the bottom of the table up to 500 rows. You will be able to see the total of the report data in the bottom row of the report. Unique User-based Metrics on the Monetization Reports are supported on SDK 6.3.0+ for Android and 6.3.2+ for iOS. Click on the separate metrics to see dedicated graphs for that metric. These metrics provide granular data on unique user behavior. By clicking on the tooltip in the top right corner of each metric, you’ll find its definition and current trend details. 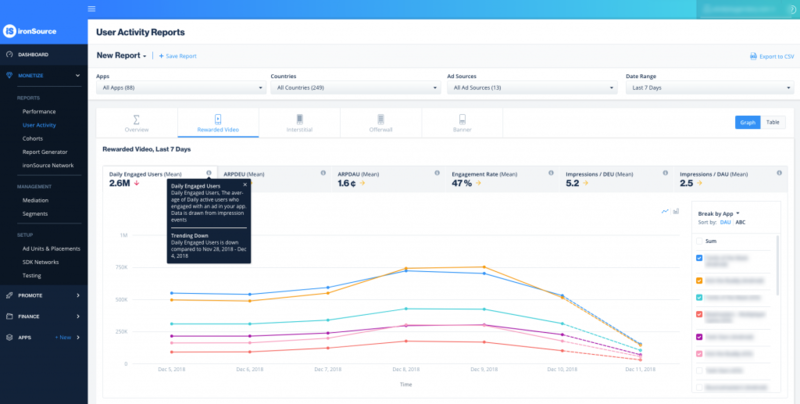 ironSource provides deep insights into your app’s ad performance with a wide range of unique user metrics. 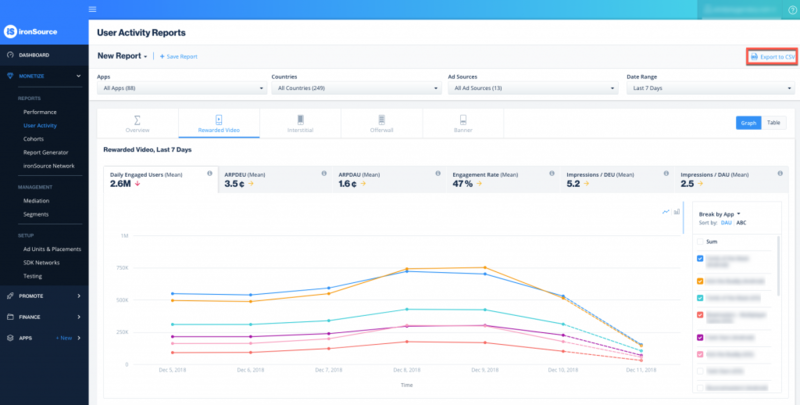 These advanced metrics help you understand how your users interact with your app and the ads you serve; allowing for better implementation and control. DEU: Daily Engaged Users, the average of daily active users who engaged with an ad in your app. Data is drawn from impression events. The following window will open and you can verify your breakdowns and metrics (these include Performance metrics). Make sure the Date Range is correct. Click ‘Download CSV’ and the file will download to your computer.